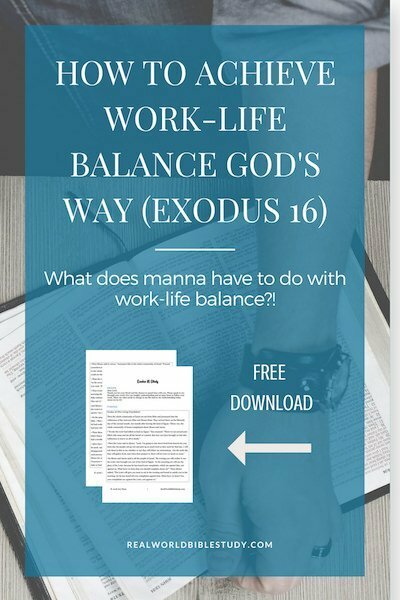 What does manna have to do with work-life balance? Have you ever received a gift that someone thought you needed? I hear this all the time on The Dave Ramsey Show: someone’s aunt or brother gives them one of Dave’s books for Christmas, and the receiver is disappointed. Only later do they realize they’ve been given the keys to getting out of financial survival mode. This week I’ve been studying a story about some folks just like that; they’ve been given a beautiful gift but they don’t recognize its value. And why should they? After 400 years of slavery, what do they know about work-life balance? Today I’m sharing one of the takeaways from this week’s Bible study (you can read the full Bible study here.). Life-changing Bible study uses story, so here’s a little bit of the story before we get into it! See, the Israelite people had been slaves in Egypt for 400 years. They had picked up some of the religious practices and beliefs of their neighbors, wrong ideas about God and people, and “they were reduced to being slaves rather than owners and managers of the land” (NLT Study Bible 14). Either they’ve forgotten God’s promises or just given up on them. When Moses steps onto the scene to lead them out of Egypt, they are so hopeless that they are suspicious of his offer! They wandered in the desert for 40 years, not because it would take 40 years to get where they were going, but because they needed 40 years for God to remake them into his people. It’s not a desert, it’s a massive halfway house! Moses steps in and leads them out of Egypt, to the tune of a series of God’s miracles. And now they are on the journey to the promised land, and they panic. They are in the desert, and they are afraid of starving, so they start to grumble. This is where we are at the start of Exodus 16. (Take a minute to read the chapter for yourself or listen to it on your favorite Bible app). God sends the gift of “manna,” which appears on the ground for the Israelites to gather each morning. The instructions: gather enough only for each day and don’t keep it overnight (when they do, it rots and gets filled with maggots. Yuck!). But on the 6th day, collect a double portion and keep it for the next day. (This time it doesn’t rot. Phew!). They are to eat the second portion on the 7th day, the “Sabbath,” and not to gather any on that day. In fact, it won’t be there to gather. You can bet a few of them went out and tried to gather it anyways! The manna story is the first introduction of Sabbath as a command for God’s people to practice. It was God’s special provision, but also a test (Exodus 16:4) to see if the people would obey, and especially a gift. As the rabbis of the Talmud expressed it, “The Holy One Blessed Be He said to Moses, ‘I have a precious gift in My treasure house, called the Sabbath, and I desire to give it to Israel.’ ” (JPS Torah Commentary). 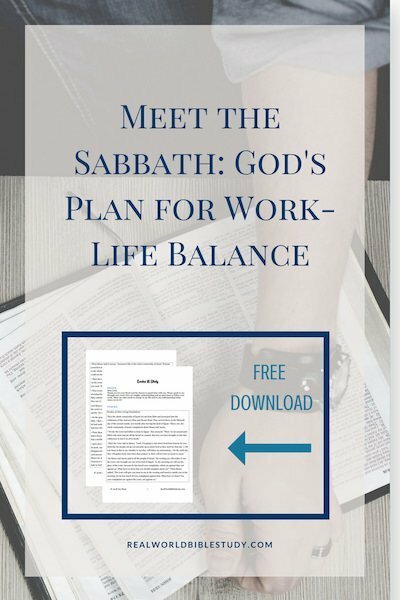 God’s plan for work-life balance is simple: work 6 days, rest 1 day. The Israelites had been slaves in Egypt for 400 years, and as I mentioned before, they were so hopeless that they didn’t even get excited about leaving. Stuck in the daily grind of work, they could see no way out, no better way. We’re a lot like that too. Thankfully, we aren’t literally slaves, but we carry the weight of our culture’s emphasis on work at all costs. We get stuck in the daily grind of work too, whether at the office or with a never-ending pile of chores. For some of us, there is no end in sight, and we can’t even imagine it getting better. Sometimes we don’t even give our best anymore because we are just so tired – physically, mentally, emotionally – all the time. Sometimes, we don’t even realize we are acting like slaves, like our work controls us. Guess what? God created us to work. It was part of his design from the beginning (Genesis 2:15). And the Bible makes it clear that God’s people are not lazy people (Proverbs 10:4-5); we should work hard. Isn’t it interesting that the manna would disappear after a few hours? If the Israelites didn’t go out and gather it, it wouldn’t be there later. And…work-life balance does not mean half work, half play. His design is that we work, really hard, doing our absolute best as he enables us to do, for 6 days, and then we rest – giving rest and worship and fun our absolute best too! – on the 7th day. Are you doing your best work? I can imagine that some of those Israelites – newly freed slaves – had a hard time kicking it into gear. It’s like after you graduate college or even finish finals week, and you want to just check out. These folks had never had to manage their own time, and I would bet there were many who only did their best work when the boss was watching. They worked hard every day, to be sure, but was it their best? I’ve definitely been through seasons like that. I was trying to do my best work, but it’s that daily grind thing again. How do you do your best work when you’re tired day after day? Even if you mean well, it won’t be your best work! When they finally had freedom, they might have been ready to just sit around like the Pirates Who Don’t Do Anything. 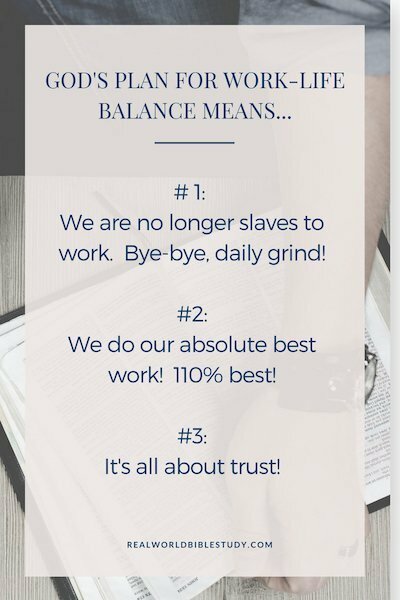 Part of work-life balance means that when we work, we do our 110% best (Colossians 3:23). 6 days, we go at it. We work hard AND smart. And then on the 7th day, we rest. And well-rested, we are able to give our all and more the other 6 days. It’s one of those “God’s economy” things; we actually do better work and are able to work smarter and more efficiently if we are getting the rest and recreation [read re-creation] God designed for us to have. At the same time, we do have to push to get it all done in 6 days if we’re going to take day 7 off. I think trust was one of the biggest things God had to teach the Israelites when they left Egypt. We don’t think about this too much, but at first, the Israelites didn’t really have a relationship with God. They hadn’t learned to trust him, so following him seemed risky. They were learning who he was. Every day when they could only collect enough for that day, the Israelites had to trust that there would be more manna the next morning. And every Sabbath that they didn’t go out and gather, they had to trust that they would have enough, that God would meet their needs like he promised. It was a 40-year lesson in trust, relying 100% on God’s provision because there was nothing else. And they struggled with it! Exodus and Numbers tell story after story of the Israelites thinking that God has bailed on them, so they go back to their old ways of doing things. Sabbath for us is also about trust. We have to trust that God will provide, that the world will keep functioning and we’ll be able to make ends meet if we don’t work one day. 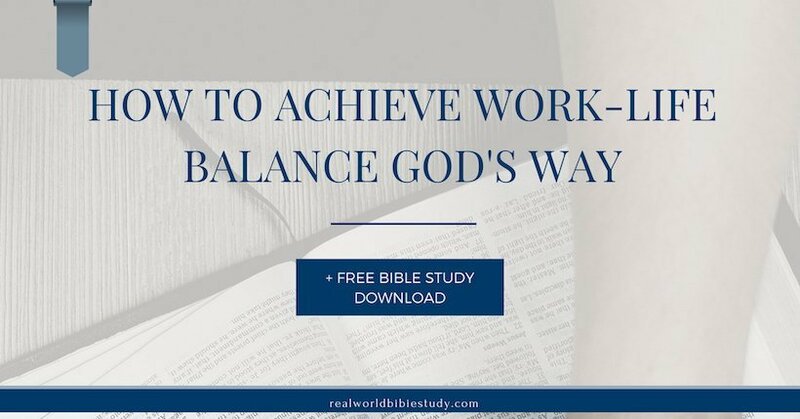 As we learn to trust and obey God in this area of our lives, work-life balance could become the natural rhythm of our lives. What are you doing (or what will you do) to take a day of rest in the midst of the crazy of our lives? It doesn’t have to be Sunday (actually, the day-of-the-week Sabbath is Saturday!). 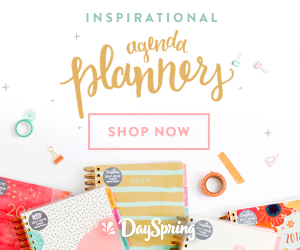 If you work a non-traditional schedule, another day may work better for you. We are no longer bound by the ritual requirements of Sabbath law. But the gift of Sabbath is still ours if we’ll receive it. This summer, I’m trying to restart a Sabbath habit on Sundays. For me, that means finishing certain things on Saturdays on purpose so that I can set them aside for a day. I’m trying to spend that time resting and recreating (re-creating…when we take time for fun, God re-creates us!) by hanging out with God, family, friends, maybe a good book. If a day seems hard to take off, try half a day and work your way up to it. 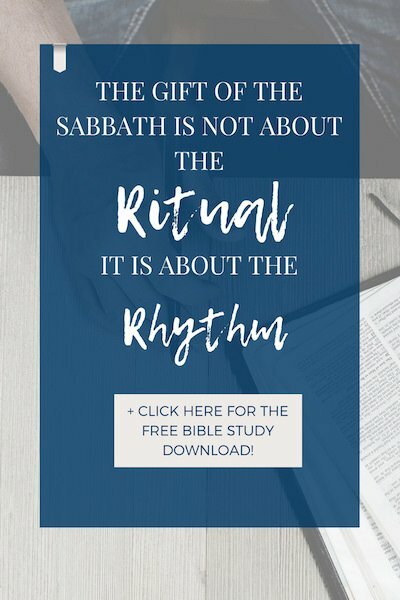 The gift of Sabbath is not about the ritual, it is about the rhythm. Work + Work + Work + Work + Work + Work + Rest, and trusting God through every step. 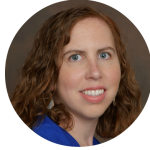 I love the idea of a “reset protocol” that Mary talks about in this post – what to do when life is overwhelming and you can’t seem to move forward. Learn more about how to practice Sabbath as a spiritual discipline here. Want the full study of Exodus 16? Sign up using the form below! So true! God never designed us to work relentlessly. Sabbath is truly an exercise in trust. It’s a spiritual discipline as much as a physical one. Thanks for sharing. Isn’t it interesting how often physical and spiritual disciplines go hand-in-hand? This is a beautiful Bible Study!